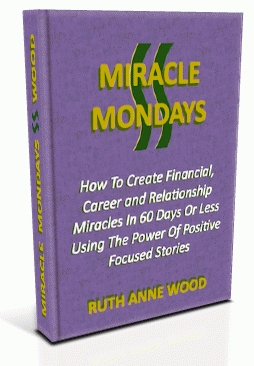 How To Create Financial, Career and Relationship Miracles in 60 Days Or Less Using The Power Of Positive Focused Stories. From The Desk Of Ruth Anne Wood Doylestown, Pa. If you consider yourself a spiritual person but are having trouble tuning into and attracting the right people in your personal and professional life. Perspective clients, vendors, employees, investors, VAs, Joint venture partners and and even romantic interests have let you down. Maybe they worked for a while and now you are regretting your decision to work with these people this could be the most important book you’ve ever read. We are so easily distracted by the media, advice from the people closest to us, vendors, marketers, neighbors, co-worker, employee or business partner drama and yet we’ve all been guilty of tuning into what we really want. The problem is goal setting, meditation, affirmations and prayer while helpful and theory hasn’t helped fully focus our attention on what we want and we still fall pray to time, money and precious energy wasters such as fear, anger, resentment, fatigue, grief, self pity, regret, shame, stress and putting out fires in our personal and professional lives. So when a dream come true opportunity to save money, make money, feel more love and mutual awe, expand our abilities to receive more of what we desire, receive more respect comes along we sometimes miss it until good old 20/20 hindsight. Only then do we realize that we were presented with the right potential projects, purchases, blind dates, perspective employee, investors or business partners. Instead in that moment of opportunity during that interview, sales meeting, blind date, family pow wow, networking group, we were met with emotional safeguards that came in the form of; confusion, overwhelm, mistrust, projection and fear and this slowed down our ability to confidently step into that truly great opportunity with eyes and heart wide open. What if you don’t know how to intercept bad habits or predict disastrous behavior in others and the clock is ticking with pending financial, career and relationship demands? And if you don’t come up with a new behavior or outcome fast you are facing costly and painful relationship, legal or financial consequences? For over a decade I’ve been working with people living paycheck to pay check recognize their real untapped value and have leaps of income in 1-30 days to people 7+ figure earners having record profits with the Miracle conversations we have had. I’ve helped people holding onto exes and finally become a vibrational match to their ideal dream come true business and romantic partners anywhere from 6 months to 14 days. These same clients used what I’ve taught them to win big on real estate transactions, have painful relationship dramas and legal and tax issues evaporate once they began to use the tool I offer in Miracle Mondays to mentally and emotionally stay positively focused on their intended, specific, measurable, dream come true results. Or quickly resolve the costly drama between the people who have let you down, cost you precious time, money and energy and dragged you through the legal, financial and once trusted relationship mud. If you’d like to create new patterns of behavior that helps you save you precious time, money, your health and sanity …regardless of your financial, relationship or legal problems… And you don’t want to go to therapy, talk to the offending party directly that continues to wreak havoc on you relationships, finances or are creating pending legal issues- This is the most important book you’ll ever read. And like I said, Yes! You can read this entire book today and start applying it. There are a handful of powerful exercises in this book that you can start using a couple minutes after you read about them. But before I tell you about them, let me make something perfectly clear: This isn’t one of those “religious”, “career”, “financial” “business” “relationship”, “motivational” or “spiritual” websites that promises you a happier, more fulfilled, productive and healthier life for doing nothing. Here’s the deal. What you’re getting is working great for me, and it’s the exact system I’ve used to help my clients focus their attention on the best-case scenario results they wanted even if the current reality said, “their ship was going down”. And especially if it’s not your direct fault that a person you work with or was close to you is ruining your finances, peace of mind and reputation. If you go the traditional route of trying to get past the legal, financial and relationship nightmare you still have to pay a boat load with your; time, money and emotional, mentally and physical health! Within days of planting the new seeds of financial, career and relationship miracles my family members and clients’ financial, legal, career and relationships quickly matched their new desired outcome much to their amazement and adoration. Saving thousands on bogus legal case fees thrown out the day of trial. A tax auditor admitted to his accounting error during a scary next day surprise charity audit. A divorced man hopelessly having a series of dead end blind dates suddenly met two dream come true women in 14 days and one of them is still with him years later. A woman about to walk away from her half of a multi-million dollar estate to save herself and teenage son for an abusive man, found peace, clarity and strength to laugh at the drama around her abusive ex husband (rather than cower in his manipulative presence) and she claimed her rightful half of 25 years of helping build up his legal practice and real estate portfolio. A woman needing money got an $8,000 client within days of our 90 minute “miracle turn around” conversation when she normally makes $100 an hour. And another man five figures in debt closed his first $30,000 client in thirty days. A hard working married hair dresser struggling to pay for three daughters’ college received an unexpected gift from a distant relative: four year college tuition, room and board for the eldest daughter conservatively priced at $30,000 per year or a unexpected financial gift of $120,000. And I love working with the companies that have customers with outstanding debts who suddenly pay in full. Just in the past 45 days, I’ve used the tools you’re getting in MIRACLE MONDAYS to line up joint venture partnerships and work with my ideal visionary, problem solving, go-getter, spiritually open minded clients and industry leaders. Some are entrepreneurs, others are stay at home parents and retirees hoping to find their passion and create a positive legacy. Others are companies generating financial, legal and personal and professional relationship Turn Arounds In 60 Days Or Less. And some all it takes is a 90 minute conversation on how to write their success story and best case scenario in a language that would lazar focus their emotional and mental state to invent a new future and start seeing evidence of their new reality shift in the peoples behavior and conversations around them. 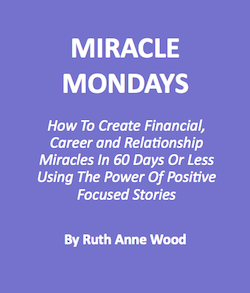 The good news is the more these clients are in the Miracle Monday environment/mindset by reading their success scripts shared step-by-step in MIRACLE MONDAYS book and online community the more often they have experienced massive growth in their finances and relationships and less costly drama. It was if the tools I shared were Google Alerts, but instead of just sending notifications that people were talking about their keywords the subconscious mind and senses primed in these Miracle Monday Scripting For Success tools alert the whole body about opportunities to quickly and confidently avoid or embrace. So don’t worry – you’re not going to be pitched on bogus “get rich quick” or “MLM” garbage here. Oh and those unexpected gift and new business figures for the past 45 days? That’s new revenue and savings without additional help from lawyers, financial advisors or shrinks. That’s an average of $8,085.91 in savings and additional income. But I’m not suggesting that everyone (or anyone) who reads this digital book is going to suddenly receive an unexpected client that wants to pay 80 sessions in advance or have a conversation with a generous relative that is suddenly offering to pay your biggest investments in you and your family’s future…or any money at all for that matter. *Hint it may even in someone else’s life real or fictional, close or celebrity that helps you quickly set filters and alerts for your best opportunities. I don’t know how much the people who read it will make, save or get out of financial, relationship and/or career headaches – it’s likely that many or most of them will make or save little or nothing and won’t witness the happily-ever-after-events or opportunities at all (especially if they don’t follow the directions and work hard at setting aside their current limiting beliefs on worthiness, receiving and planning for the dream come true results they do want). This is dramatically different from anything you’ve ever read because it’s more of a “field guide” to massive planning and tracking specific measurable results through specific focusing and manifesting techniques than a traditional financial, career or relationship fixing “book”. The reason why is because there’s no fluff or filler. It immediately gets down to brass tacks, showing you exactly what to do, how to do it, and why. Plus, it’s easy. At just 63 pages, you can read it in an afternoon. And you’ll immediately “get” the entire methodology I’m personally using to help my clients to create more financial. career and relationship miracle in an average of 30 days or less. Here’s just a fraction of what’s inside and what it might mean for your financial, legal or relationship situation. The crazy clients, business partners, significant others, family members, disappointing co-workers, flaky sub-contractors and lazy or overwhelmed employees that are creating a nightmare size career, financial or relationship migraine for you don’t have to participate or know what you are doing to get these fast transformational results! The very thing that they are doing intentionally or out of incompetence that’s hurting your business, income, reputations, peace of mind, dividing the family, causing you sleepless anxiety filled nights, can now help you get better than expected best case scenario results faster than dreamed possible simply by doing a judo mindset move and flipping their crazing antics in your heart and mind and coming up with a new fairytale like ending despite your past drama or projected pending financial, legal and relationship doom. Breakthrough tactic to TRANSCEND the problem rather than getting stuck trying to fix it. It’s basically following Albert Einstein’s, “We can not solve our problems with the same level of thinking that created them.” Very few businesses or individuals do this, even though it’s around 300 times easier than the “normal” methods everyone else does. You’ll get a crystal clear understanding of this on page 16. How to turn down the volume and lesson the controlling grip the media, your family, business associates and legal and financial counsel has on your current problems. Create a new story that has magic powers to transform the course of your life. There are only three proven steps to creating financial, legal and relationship miracles, and they work together in perfect synergy when applied in the right order. On page 32, you’ll get the exact 5-step system for focusing your attention on your best case scenario dream come true results that drives this entire system. You’ll instantly understand it so you can apply it to your finances, relationships and legal matters today. Implement this and you can completely predict pending financial, relationship and career problems and how to avoid them in the future and clean up your current mess…catapulting yourself, your business, and your personal peace of mind to a higher more profitable and gratifying level of fulfillment without looking over your shoulder for the other shoe to drop. Have that prepared confidence and knowing that is often compared to that déjà vu, intuition feeling that leads to better financial deals and dream come true conversations and connections without having to go back to business school, join an online romance training course or change anything about yourself or the people around you. I walk you through a present-day case study and reveal exactly how this is done, why it works, and the exact steps you can take to have the same “miracle turn around” with your personal and professional problems. I’ve personally deployed this strategy with clients with no money and they had some of the worst bogus legal claims against them from crazy exes and family members and yet they were able to feel more peace, forgiveness, joy and positive shift than they had in years within a couple of hours. End result? THE PENDING DOOM of closing their business, having to go to trial or be the under dog dealing with a cheating, lying soon to be ex didn’t touch them and never happened. With just taking stock at their current mental and emotional resources they had all they need to thrive in the face of crazy adversity. This one tip alone can literally alter the course of your life…practically overnight …transforming you into a victory financial, legal or relationship story with much more positive, supportive win/win people clamoring to be associated with you. Think that paying off your debts or dealing with the pending legal issues or seeking revenge on the crazy, incompetent people in your life is the first step to a desirable outcome? Think again! How to have a radar for pending danger or harmful partnerships, business deals and situations saving your tons of precious time, money, resources and your good reputation with a simple tool for quickly increasing your sensitivity on the “THIS AIN’T FOR ME” meter …The secret is this two-step formula that works even if you’re not good at: luck, prayer, mediation or goal setting”. (Page 8). How you can bypass dream boards, affirmations, list of goals, mind movies, hypnosis and therapy and use a process that helps you connect with the energy, emotion, passion and focus on the desired result almost instantly. How to easily step into the leading role of your life that usually takes a mid life crisis or deep dark night of the soul and have others start unconsciously treating you in your new and improved role. (This has worked great for people under appreciated in their family, company and news media). What to tell yourself and others to instantly start creating a more engaging, healthy, generous and prosperous life. (Starting on page 22.) But that’s not all. You’ll also uncover enviable success secrets like …How To Cash In On All Those Unpaid Favors To Generate Income. The WORST time to try to ask for help from others: (Thank God, there’s a way to ask and receive help without the fear of rejection or appearing to needy and desperate.) Use my unusual communication technique to bypass the awkwardness between friends, clients, co-workers and people you don’t know. Why you should NEVER be charitable to others unless you come from this perspective. Now there’s a new process that reverses pending financial, legal and relationship drama and …and it’s best to do without the offending party knowing your activity. Discover what it is and precisely how to deploy it on page 20. How billion dollar CEOs, politicians, and even cult leaders are not immune from financial, legal and relationship challenges and how you both can use this process to significantly improve your personal and global economy. Major breakthrough on page 35. The fastest way to make the crazy makers and drama to go away- (Whatever you do, DON’T follow their crazy demands!) Page 9 You’re right …that is a lot of proven, real-world strategies and tactics that are working right now. And it’s stuff that nobody else can share with you because nobody else is doing it. I know there are some websites out there that offer you a great deal on something but then they stick you in some program that charges your card every month. This isn’t one of them. There’s NO hidden “continuity program” you have to try or anything even remotely like that. I’m literally giving you this entire digital book and it’s transformational content, for $9.39 with the option to get some great media exposure for sharing your results, as a means of “putting my best foot forward” and demonstrating real value. My hope is that you’ll love it and this will be the start of a good business relationship for years to come. But with all that said, there is ONE thing to keep in mind: Time Is Of The Essence Here’s why. I’m giving this bonus training in addition to the purchased digital book as a test. I’m looking for some more really amazing success stories to be feature in my upcoming marketing video and media coverage. After all who wouldn’t want to be featured for career, financial and relationship miracles and have this be a turning point, legacy in your life, family and community? And this is also for successful entrepreneurs, joint venture partners, large organizations who want transformational customer and employee buy in (on a subconscious energized level) business professionals who are looking for any additional edge to take your record income and stellar relationships to the next level without wasting any extra of your precious, time, money or energy. Also… Because I am sharing this offer with the best selling authors, 7 figure coaches and community leaders I’ve worked with who have respectable sized engaged audiences and are also getting this message at the same time you are. And the last time I helped with their book launches they reached best seller status with careful planning in a few short weeks. So it’s simply a matter of supply and demand. Here I show the professional wife how to get really clear on the results she wanted to create in her business starting with how to just attract her ideal clients with her presentations and not waste time with tire kickers, and also how to feel more ease, energy, health and joy through out the work week. This was a new approach I wasn’t entirely sure of, but boy did it ever work! Anyway – I’ve created a full-blown training around this approach (In MIracle Mondays) and I’m giving you this hour-long advance preview version of a typical first client Scripting For Success session in hopes you’ll give me your feedback for creating future trainings. And by the way, I plan to sell this in the future with online support for at least $1,000.00 so I want you to know this isn’t some gimmick. It’s a real advanced level in depth training where you’re not only seeing every aspect of leveraging the resources you already have, you’re also being shown how to quickly assess and implement it. I 100% Guarantee you’ll love this book and the bonus audio training and cheat sheet or I’ll return your $9.39 for serious product testers and let you keep the book and the training anyway. That’s right. You don’t even have to send anything back. Just email me or call the number on your receipt and I’ll give you back your $9.39 with no questions asked. How’s that for fair? It’s a step-by-step guide in helping people create Financial, Career and Relationship miracles by uncovering blocks around self-worth and uncovering an abundance of mental and emotional resources. Helping people shift from fear to love by quickly using the emotionally focused imagination to create specific, measurable, dream come true results. In case you’re one of those people (like me) who just skip to the end of the letter, here’s the deal: I’m selling you a 63 page book that outlines the exact manifesting formula I’m using to help my clients receive “small” and “big” gifts from the Higher Power that include financial, relationship and career miracles. The book is $9.39. I’m also giving you an hour-long audio training which outlines a how I work with and connect with dream come true professional partners. This is an approach that automates what you’re getting in the book, and it’s working very well. Anyway, this is something I’ve sold for $1000 a month for private clients and plan to sell for at least $1,000.00 for groups in the future. (Pay attention to this in the book where I demonstrate how people who mentally and emotionally reversed their focus on their debt saw financial miracles)- so this will probably sell out quickly. There is no “catch” to this offer. In fact, if you don’t like the book let me know and I’ll even give you back the $9.39 you spent on the book. You don’t even need to send the book back or delete the training. You won’t regret it. Thanks for taking the time to read this letter and I look forward to hearing from you soon! © 2014 Scripting For Success. Website developed by Immersion Technology Inc.